Gettin’ Buzzed | Food and Drink | Style Weekly - Richmond, VA local news, arts, and events. Just south of the river, a corner coffee joint has struck the right balance between beans and bourbon. Scott Elmquist Brewer’s Cafe owner Ajay Brewer holds a Dirty Bourbon Chai Latte. These days, plenty of coffee shops serve up cold bottles of suds and bulbs of wine alongside lattes and Americanos. But hard liquor? That's a little more rare. Manchester staple Brewer's Cafe might be best known for its chill vibe, loyal following and mouth-watering eats, but you can't help but notice a chalkboard showcasing an extensive list of bourbon hanging out alongside the neighboring sandwich list. More than 20 bourbons and whiskeys to be exact, folks. So how on earth did a corner coffee joint end up as a bourbon bar? Part happenstance, part genius. 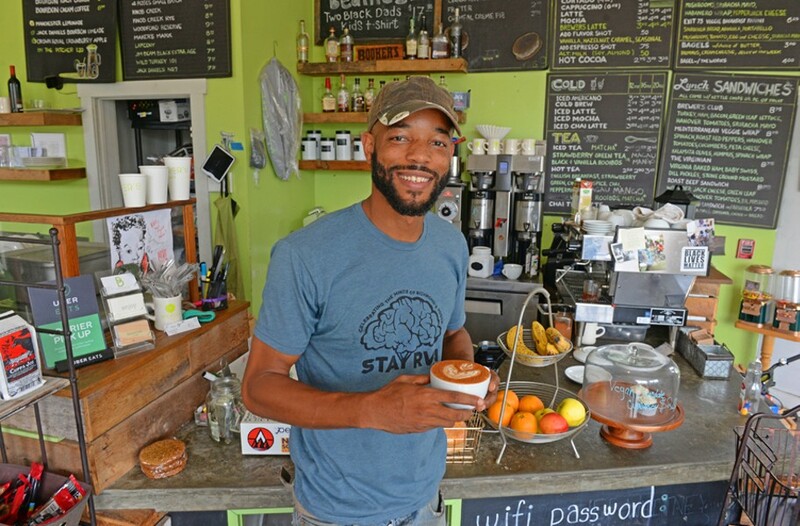 Owner Ajay Brewer explains that his original concept was something like Washington's Busboys and Poets — part bookstore, part restaurant and part lounge — but due to space constraints, some plans had to be put on hold. "I didn't want to trash including liquor, but I knew I had to have the perfect idea to do it," he says. Brewer ended up on a drink panel with certified bourbon sommelier George "Brak" Braxton at a food conference and ideas started to flow. "I heard him talk and was like: Bingo: that's it. I don't have to bring in vodka, tequila and all that other stuff. I can do bourbon. Bourbon. Brewing. Bar. You know, alliteration," he says with a laugh. "When you think of all the drinks you can do with bourbon, it makes sense. Toddies, Irish coffees, that's just a start." Braxton continues to help him choose the drink list since Brewer isn't much of a drinker. "I've got one kidney, so I really shouldn't even be running a coffee shop and drinking caffeine," he says. 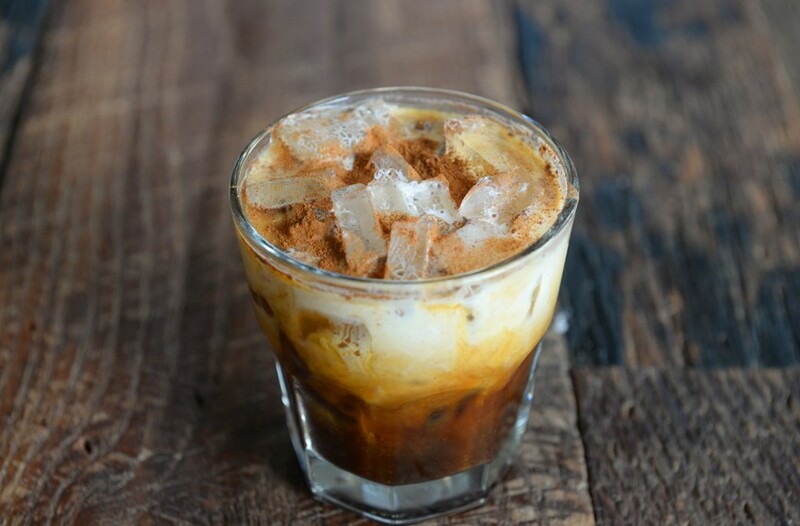 A Bourbon Toast Crunch features espresso, simple syrup, Saigon cinnamon, bourbon and half and half over ice. Among the customer favorites at Brewer's are the Bourbon Toast Crunch and Dirty Bourbon Chai Latte, both available hot or iced. Unlike similar drinks you might find elsewhere, Brewer's Cafe uses real cinnamon, vanilla and house-made simple syrup with solid bourbon versus junk like Fireball, typically used to concoct sweet and spicy libations. If old standbys are your thing, you can get an Old Fashioned or Kentucky Mule. Daily happy-hour specials render all of these libations a steal. Occasionally, Brewer will hold bourbon tastings and other boozy-centric events, but reiterates that he doesn't want a bar scene, which is why the cafe specializes in drinks rather than shots, though technically you could get one. "I've got people in here studying and listening to music, I don't need somebody hanging out doing shots," Brewer says. "We're more laid back and upscale than that. I wanted the alcohol to match the vibe of the shop."